After a long search and detailed studies into Vizslas we were delighted to be strongly recommended Stoopside. Clare’s passion, knowledge and care for her dogs and the breed in general, were immediately obvious. We received lots of help and guidance throughout and we are comforted to know Clare is always on the end of the phone with caring advice and a genuine interest in the long term wellbeing of her dogs. Frankie has been a wonderful addition to our family, proving to be a loving and loyal companion to us all. He has become the centre of our children’s world and our family is all the stronger for his inclusion. 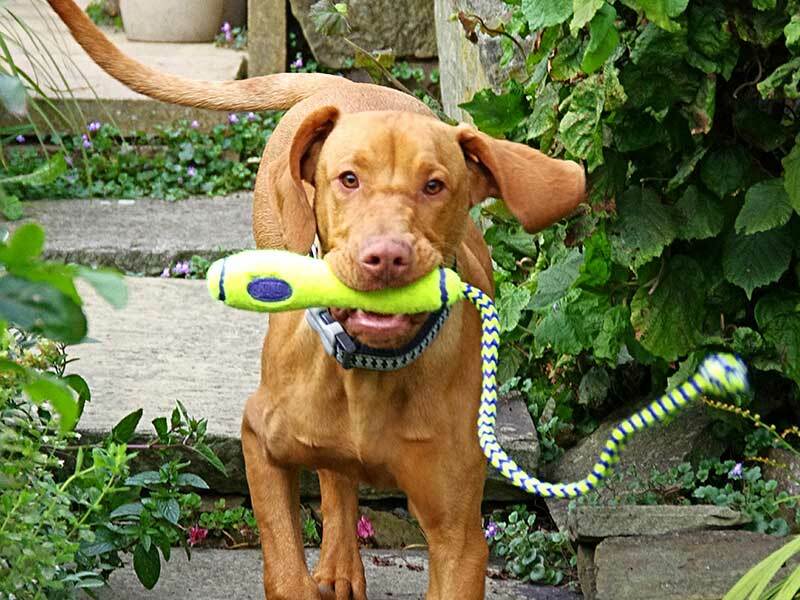 I would recommended Stoopside to anyone who was serious about making a long term commitment to having a Vizsla in their lives. This little chap ‘Zenon’ arriving at his new home some three years ago. Clare and Joe did an excellent job re-homing this little chap in his ‘forever home’. He still goes back for holidays to Stoopside. Having already got a one year old Vizsla we decided to look for a playmate. Having done some research we eventually came across an expected litter at Stoopside through the Kennel Club. We made contact and went to visit the ‘mum to be.’ Clare and Joe made us all very welcome and we went ahead to put our reservation down. We eagerly awaited news that the pups were on their way, Clare kept us updated via text as each pup was born. We sat in anticipation that there would be two females at least due to being second reserve for a female. We will go down in ‘Stoopside’ history for being the most indecisive family ever. We were undecided between the pup with the pink collar or the one with the yellow collar. Clare did not rush us and simply left us to make our choice having told us about each puppies character. After a lot of deliberation we chose the yellow collar but at the last minute as we walked away my husband changed his mind and we chose the pink collar instead – Lottie. We collected Lottie after our holiday and haven’t looked back since. She is so gentle and loving which is credit to Clare for the time and dedication she puts into each individual puppy and litter. Due to Stoopside being so local we regularly revisit Clare to have a chat and of course a cuddle with the any new litters. We have remained good friends through this process and Clare is always on hand to offer advise when we have needed it. 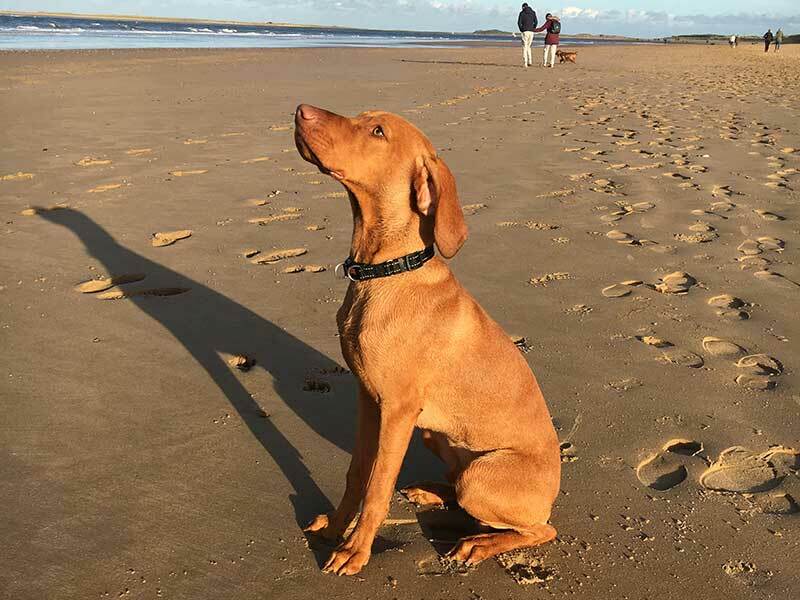 We would have no hesitation in recommending ‘Stoopside Vizslas’ as we came home with a very contented, playful and loving puppy. We have had our lovely Tilo for just over 18months now, one of Bella’s litter. The kennels are clean and well kept and all the dogs healthy and very well looked after and obviously loved very much. Clare has boarded Tilo for us for day visits and holiday weeks and keeps her in the house as a pet. They are walked every day no matter what the weather and Clare enjoys having one of her puppies back to see how they are doing. If we had a bigger house and garden I would have another one for sure. We visited the litter to choose our pup and picked her up 2 weeks later after her injections with all necessary paperwork ready. Clare was on the end of her phone in those early days for advice and support. We wouldn’t be without Tilo for anything now and can’t recommend Clare highly enough. 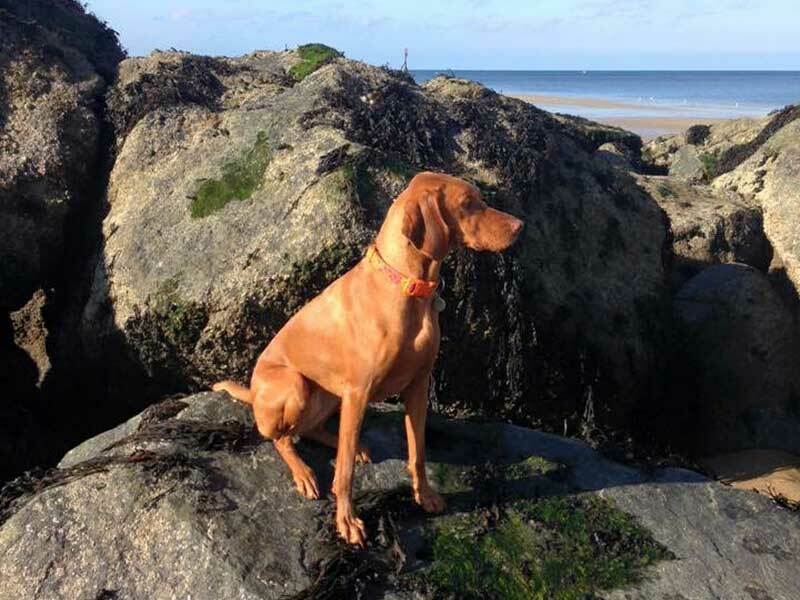 We were interested in buying a Hungarian Vizsla with good, healthy bloodlines from a KC Registered Breeder. We didn’t intend to use our pup for hunting, we wanted a companion to complete our little family. It was very important for me to do lots of research in order to find a ‘responsible breeder’. As we live on the Isle of Man, we knew we would have to travel to England to collect a well-bred puppy. Even though we would have to travel a little further, we chose Stoopside as Clare was a very kind communicator right from the beginning by telling us all (and more) the information we needed to know to ensure a Vizsla is a perfect suit for us. She answered all of our questions straight away by telephone, which was followed up by an email with all the necessary information we needed to know about vizslas and Stoopside themselves. We were also sent pictures of both parents & previous puppies. We loved how they’re a small kennel & adore all their dogs. In addition to this, they offer a lifetime of support and love to be updated of their puppies’ well-being after they’ve gone to their new homes.Further to all the information provided, they have a Facebook page where you can follow all their beautiful dogs & keep up to date with regular posts about how your pup is getting on right up until you collect them. As we live quite far away, we weren’t planning to go over & choose our pup. Clare & Joe offered to skype us so we could choose that way & even offered to pick us up from the train station nearest to them if we did decide to go. In the end, we travelled to Stoopside to choose our dog when he was 5 weeks old, we were shown all the puppies with their mum, and in their home. It was nearly impossible to choose as they were all gorgeous. We travelled to collect our puppy when he was 8 weeks old. Clare & Joe were fantastic & I can’t imagine buying a dog from anyone else, since day 1 of being in touch with them, we had no doubts in our mind. If we decide on another Vizsla in the future, we will definitely get it from Stoopside. We adore our little pooch, he completes our little family. He is beautifully natured and it’s all down to Clare & Joe. My partner and I had a puppy from Bella’s litter in April this year (2017). From initial contact all the way up to collection, Stoopside Vizslas were incredibly friendly and helpful and made the process of getting our first pup together a wonderful one. What we liked is that they really took the time to get to know us and what home life would be like for our pup, making us feel we were dealing with a very responsible and trustworthy breeder. As for our pup, he’s fabulous. 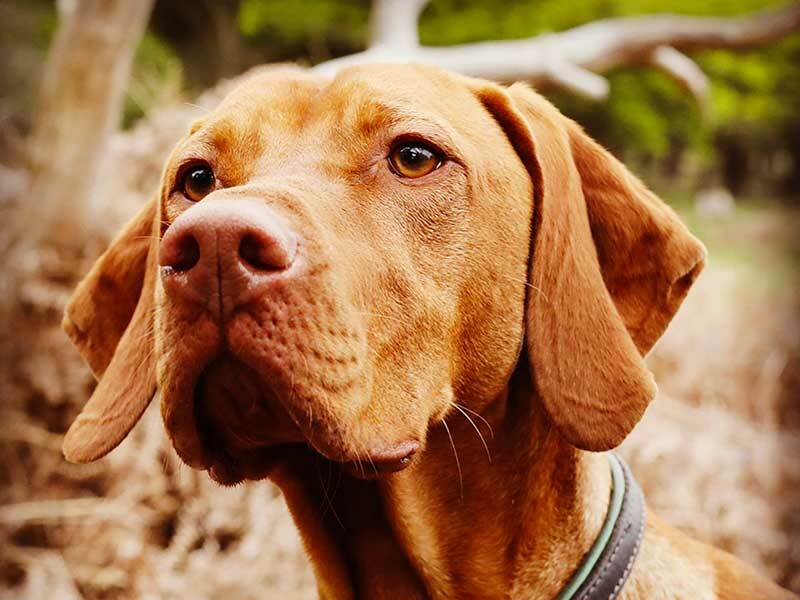 Beautiful, healthy, happy, bouncy and everything else a Vizsla should be. We’re thrilled. It’s also been great staying in touch with Stoopside as well as Dexter’s brothers and sisters. We regularly share photos and stories and it really does feel like a little family. When the time is right for us to consider our next one, we would go back to Stoopside in a heartbeat. What a fantastic family experience, I would highly recommend Clare and Stoopside Vizslas, as a family with 2 young children, we had sent time researching what breed of dog would make an ideal addition to our family, after deciding we were interested in Wire haired Vizslas and finding Stoopside Vizslas via the Kennel Club I phoned to find out more. Clare was so very friendly and helpful, and after discussing the breed, offered for all the family to go and meet and send some time with Jolan & Alfie to see how we all got on. Well what can I say we were smitten, they were beautiful, friendly and exceptional well behaved, the children (6 yrs and 5 yrs) had a fantastic time playing in the garden whilst we stood back and watched. Our minds were well and truly made up. 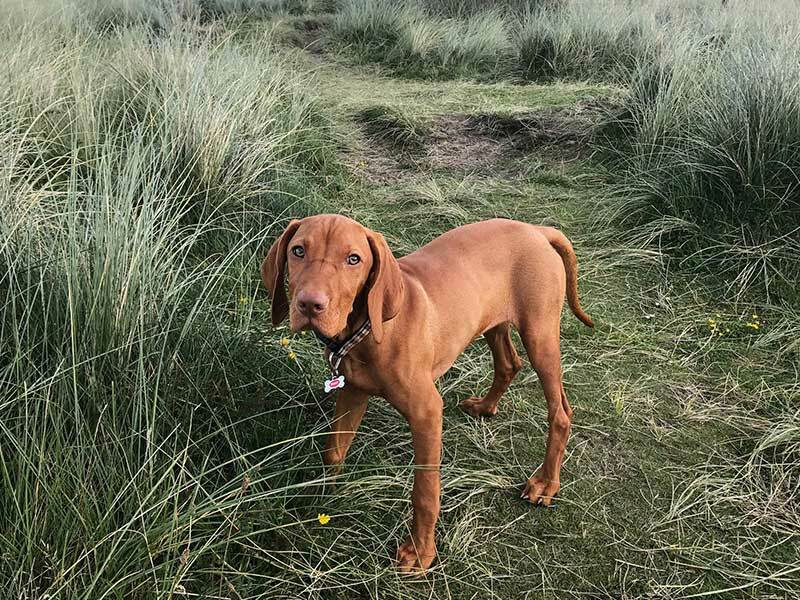 From putting our deposit down to choosing our puppy, Clare was fantastic we were kept up to date with how Jolan and the puppies were doing, we were given lots of advice both verbally and written all of which has been invaluable. We all choose our little red collared puppy, well I think she choose us and we named her Connie, and couldn’t wait to bring her home. Connie came to use knowing the basics commands and as a loving, contented, very kind and social puppy (thank you Claire and Joe), she is a fantastic and beautiful additional to our family, we all adore her, she is everything we could have wished for, playful with the children but also very gentle with a fantastic temprement incredible for a 4 month old puppy. Clare & Joe have passion and lots of fantastic experience and its very clear that all their beautiful dogs make up one big family. Thank you so much from all our family from our first phone call to having Connie at home, Clare has so much experience, is always there for continued advice and support if we need it.